Two years ago I subscribed to a CSA (community-supported agriculture) produce box. Every week I got a delivery of farm-fresh produce. 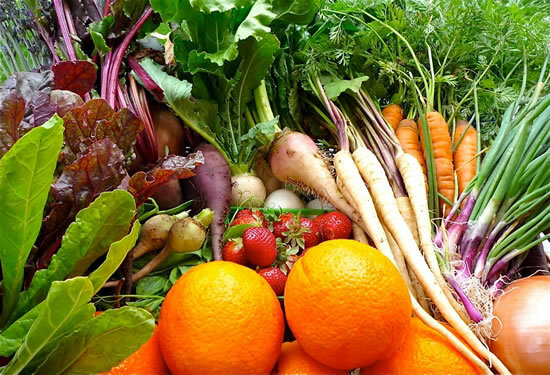 At first I felt inundated with more vegetables than I knew what to do with. Since I didn’t want to let the good food go to waste, I got busy cooking. I had to find new recipes to cook vegetables that were unfamiliar to me. I embraced the challenge like an Iron Chef with a secret ingredient. The flavorful, fresh produce tasted so good that simple recipes came out well. Some cooking attempts didn’t turn out, but overall, we added many delicious vegetable dishes to our family dinner repertoire. Now I shop at a local farmers’ market to get my farm-fresh produce. Last year I took the October Unprocessed challenge and started reading grocery labels carefully. Reading the additives article on Eating Rules really helped me understand the ingredients on labels. I learned that most unfamiliar words are processed ingredients, but not all of them have to be taboo. 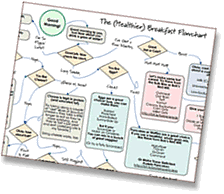 Understanding the labels better helped me to make better choices in the market. For example, I discovered that the chicken broth that I was buying had added sugar in it. The solution was simple– I just switched to another brand. Once I found my new brands and liked their taste, I was all set. Just make sure you allow for extra time in the market if you are in an extensive label reading phase. This year I am making many diet changes at once as I shift to a low cholesterol diet. I have to say that it’s been hard for me to make so many big changes at once. I have to remind myself that change can be hard and that it is a process that happens over time. I’m out of my cooking repertoire. Thus, preparing meals is taking longer, and some of the food doesn’t taste great. I feel pressure when my family is sitting at the dinner table waiting to eat. Sometimes they don’t understand why I can’t cook what I usually cook. Other times they are excited about new, successful dishes. So just know that if you are struggling, sometimes I am too. I may get disappointed or frustrated, but I won’t be deterred for long. I keep trying to cook in new healthy ways. I’m determined to find more food that is healthy and amazingly tasty. Yes, the dishes must taste sensational. I have been wading through the dull food that just won’t cut it for a foodie like me. My repertoire of great unprocessed, healthy food keeps building. I share these recipes on my blog Foodie Goes Healthy. These simple ingredients combine to create a satisfying, tasty dish. 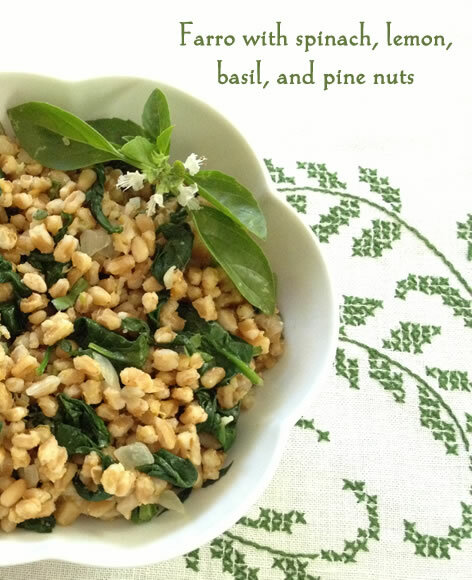 For this dish I have been experimenting with several different ancient whole grains. Suffice it to say that I haven’t mastered kamut or spelt yet, but the one thing I can say is definitely pre-soak kamut and spelt overnight. Don’t believe a package instruction that says there is a “no-soak” method for whole grain kamut and spelt. The winning grains in my house for this recipe are whole grain farro, pearled farro (some of the outer bran is removed), and whole wheat orzo pasta. If you haven’t eaten farro before, it’s a whole grain that has a slightly nutty flavor and a chewy texture similar to barley. It works as a substitute for pasta or rice in many dishes. I love that the whole grain farro doesn’t need to be soaked overnight; it just cooks a little longer. Ironically, my farro package didn’t include “no-soak” instructions for whole grain farro, so I’ve included instructions below. Put the whole grain farro, stock, and salt in a small pot. Bring to a boil. Cover and reduce flame to low. Cook for 40-45 minutes or until the farro is tender but not mushy. For pearled farro, the cooking time is approximately 25 minutes. My recipe is inspired by an orzo dish in Cooking With Too Hot Tamales by Mary Sue Milliken and Susan Feniger. I like to cook farro and beans when I have more time over the weekend and store them for later use in multiple dishes during the week. This recipe comes together quickly on a weeknight if the farro and beans are made ahead. This hearty dish can be made earlier in the day and then reheated. 1 cup cooked white beans optional Note that home-cooked flavorful beans will taste best, but canned beans can be substituted. In a large sauté pan, heat oil over medium heat. Add the onions and sauté for about 8 minutes. Add garlic and sauté for 2 minutes more, until the onions are translucent. Then add the spinach with the water still clinging to the leaves. Sauté until the spinach is wilted and just tender, about 3 minutes. Sprinkle the spinach with a large pinch of salt and a couple grinds of pepper. Next add the cooked farro, pine nuts, lemon zest, and cooked beans (optional) to the pan. Stir to combine, and warm up all the ingredients on the stove stirring occasionally. Add the basil and parmesan cheese (optional). Taste for seasoning: add a few pinches of salt and several grinds of pepper. Also, taste for balance of flavors, and add a little more zest or basil if preferred. Serve warm. Add cooked farro to vegetable soup. 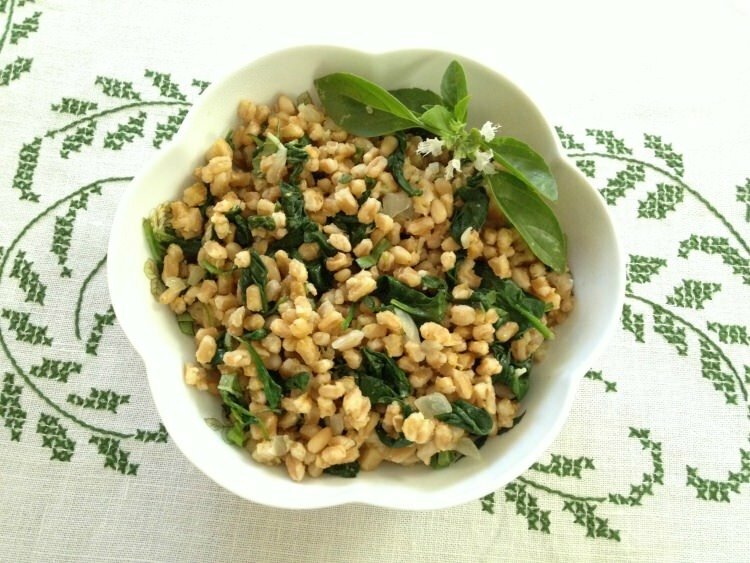 Mix cooked farro with heirloom tomato sauce or pesto sauce as a side dish. Dana is an experienced home cook on a quest to develop recipes that are both healthy and tasty. She’s a foodie first, so every healthy recipe must pass the delicious test. Dana loves the story behind each recipe — what inspired the dish, who gave her the recipe, and how food brings people together. Check out her blog, Foodie Goes Healthy, where every recipe has a story. You can also find Dana on Facebook, Twitter, and Instagram. This is absolutely a fantastic recipe. I can’t wait to make it. It sounds delicious, but is farro gluten free? I tried googling but it didn’t say, though it doesn’t sound like it is? Would this be a main dish or a side dish? Farro is not gluten-free – it’s an “ancient” form of wheat. I’d bet Sorghum or Quinoa would be delicious, gluten-free substitutions, though! I am loving the recipes that are coming everyday and this one is no exception. I love farro and this recipe has my name all over it. Thanks for sharing. What about the Trader Joe’s 10 Minute Farro? Would that be acceptable or is it a ‘processed’ food? 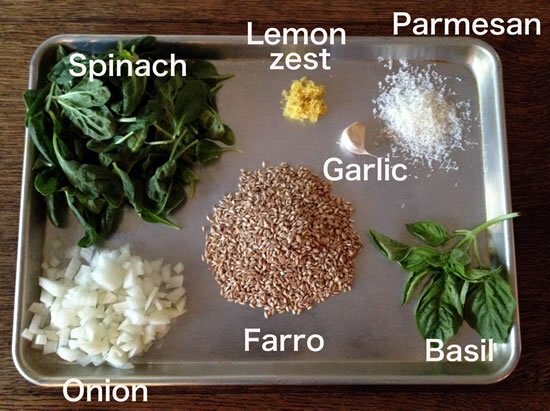 This looks so delish and I love farro so I am anxious to try it. Sharon- great question. From a taste standpoint, I personally don’t think that the TJ “10 minute” grains have as good a texture as a cooked whole grain. From a convenience standpoint: if you want your whole grain farro to cook up in 10 minutes, just soak them overnight in the refrigerator (as per the Bob’s Red Mill package directions). I’ll let Andrew and the nutritionists explain the science and unprocessed part of your question. PS- hope you enjoy this recipe. I’m pretty sure – though not certain – that all they do is partly cook the 10-minute farro, and then dry it back out. If that’s the case, it would pass the kitchen test! Maybe next time you’re at TJ’s, ask them! What other kind of nuts do you think would work? Pine nuts are way too expensive. I tried pistachios in pesto but they were too salty. Walnuts or almonds? Terri, I have 3 suggestions for you: 1. Yes, I think you can use slivered almonds. 2. You can leave the nuts out. 3. Maybe you can find better priced pine nuts in the bulk section of a market or at Trader Joe’s. Terri, did you used salted pistachios? I’ve just recently discovered unsalted pistachios and they are delicious in pesto.